The United States has suspended Brazilian meat imports over "recurring concerns about the safety of products intended for the American market". 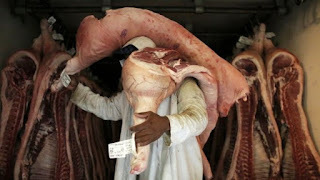 Several countries banned Brazilian meat in March, when prosecutors said health inspectors there had been taking bribes to approve sub-standard meat. The US didn't impose a ban then; instead, it introduced checks on all of Brazil's meat shipments. It says now a significant proportion of Brazilian meat failed safety tests. "The Food Safety and Inspection Service (FSIS) has refused entry to 11% of Brazilian fresh beef products" in the past three months, said the US Department of Agriculture in a statement. "That figure is substantially higher than the rejection rate of 1% of shipments from the rest of the world," it added. The American authorities have refused entry since the end of March to a total of 860,000 kg (1.9 million pounds) of Brazilian meat products over "public health concerns, sanitary conditions, and animal health issues". It exports mainly to China, the European Union and the United States. Exports fell sharply when the allegations were made public, following a Federal Police investigation.